These viruses manage to exploit social vulnerabilities and fault lines. That’s what we’re seeing in this Ebola outbreak starkly. Ok, so you have this data showing conflict-affected areas are where the major outbreaks occur, and that is “the issue of the future”. Consider this in terms of infected drones easily deployed over/under/around barriers into urban areas, and then rapid lateral transmission. I’m not trying to think out of the box here. 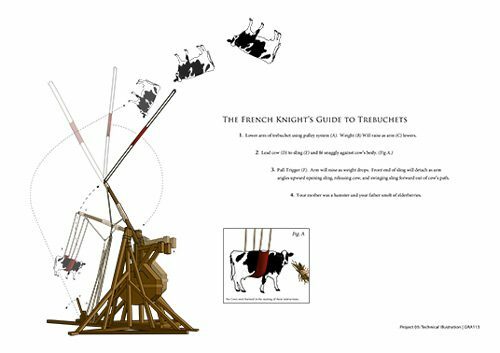 This is an ancient security worry, for those familiar with the history of siege weaponry. Who (pun not intended) can guess the current US regime’s response to the outbreak of a high-threat pathogen in the place most expected? Perhaps the title of this post gave away the answer. The US pulled its Centers of Disease Control and Prevention workers out of Beni, the outbreak epicenter. They decided it was too dangerous for America’s best Ebola experts to be there — and it sounds like they are not coming back anytime soon. […] But I understand Canada, the UK, even nonprofits with US personnel, are sending people, and you have hundreds of WHO officials deployed. Is the US government an outlier? The US government is the main country that has had constraints. Ronald Reagan’s arrival to office in 1981 was accompanied by a sentiment that the prior U.S. President’s policies should be rolled back, regardless of what they were. One of the policies ended was the arms embargo on Guatemala, put in place by Jimmy Carter due to human rights abuses by that regime. We know today that the CIA in late April 1981 was sending memos that rolled up to the White House describing the massacre of civilians within Mayan Indian territory. CIA memos documented how social support for guerrillas was high enough that soldiers said they were “forced” to fire indiscriminately into non-combatants. Two months after news of the massacre Reagan un-blocked $3.2 million in military support to Guatemala’s army. The unblocking method used was crafty, as Reagan reclassified trucks and jeeps to transport Guatemalan soldiers to commit massacres. Military vehicles known to be used in the massacres no longer were under the human rights embargo. GM’s president, Alfred P. Sloan, knew what was happening in Germany. Sloan and GM officials knew also that Hitler’s regime was expected to wage war from the outset. Headlines, radio broadcasts and newsreels made that fact apparent. America, it was feared, would once again be pulled in. Nonetheless, GM and Germany began a strategic business relationship. Opel became an essential element of the German rearmament and modernization Hitler required to subjugate Europe. To accomplish that, Germany needed to rise above the horse-drawn divisions it deployed in World War I. It needed to motorize, to blitz — that is, to attack with lightning speed. Germany would later unleash a blitzkrieg, a lightning war. Opel built the 3-ton truck named Blitz to support the German military. The Blitz truck and its numerous specialized models became the mainstay of the Blitzkrieg. In 1935, GM agreed to locate a new factory at Brandenburg, where it would be geographically less vulnerable to feared aerial bombardment by allied forces. In 1937, almost 17 percent of Opel’s Blitz trucks were sold directly to the Nazi military. This wasn’t really any kind of secret. Word of violations were published by groups like the Inter-American Human Rights Commission who in October 1981 openly called out the Guatemalan government for “thousands of illegal executions.” The Reagan Administration engaged in whataboutism and deception to avoid addressing why they would sell military aid linked to mass human rights violations; falsely claiming Guatemalan human rights violations were a guerrilla strategy (as I’ve explained elsewhere). Things escalated quickly after the U.S. government support shifted from embargo to support. The Guatemalan army issued instructions in 1982 that any resistance or incoming fire from a town or village meant everyone in the town is hostile and would be destroyed. This might sound similar if you heard recently the current U.S. regime call to troops that they treat rocks and bottles as rifles. In fact, Reagan’s support led to a fundamentalist Christian taking control of Guatemala in a March 1982 coup d’etat. General Efrain Ríos Montt seized power and announced a policy of “rifles and beans” — either eat beans quietly in obedience to dictatorship or be killed by rifles. In response Reagan described him as “a man of great personal integrity”. In March 1983, Americas Watch condemned the Guatemalan army for human rights atrocities against the Indian population. Three months after the coup was applauded by Reagan, government death squads were unleashed on civilians. And Reagan then increased military aid in 1983 to $6 million despite evidence of civilian massacres increasing at the hands of American-trained soldiers riding in American vehicles, again reported in memos to the White House. During the height of Montt’s genocidal counterinsurgency campaign, a CONFIDENTIAL cable from Secretary of State George Shultz praised his “impressive progress in human rights”. In effect, the Reagan administration worked to reverse Carter’s human rights policy, centralizing power in U.S. presidency through deception and tricks in order to expedite military support to violent dictators killing democracy. Within the U.S. government, there was no apparent struggle to reconcile the notion that the Guatemalan government “badly needed” arms with its horrific crimes. There was only a struggle to determine preconditions (which were never met) in order to gain minimal support from Congress so as to circumvent protections against abetting war criminals, which were put into place by the Carter administration. Ríos Montt wasn’t an isolated case, either. Look into Regan’s support for genocide by Indonesian dictator Suharto, or why Chadian dictator Habre (another recipient of President Reagan’s “product shipments”) was sentenced to life for war crimes. A Guatemalan former soldier has been sentenced to more than 5,000 years in prison for his role in a massacre during the country’s civil war. More than 200 people were killed in the village of Dos Erres in 1982, one of the most violent episodes in Guatemala’s brutal 36-year conflict. Santos López was found responsible for 171 of the deaths. He was a member of the Kaibiles, a US-trained counter-insurgency force fighting left-wing guerrillas. López was sentenced to 30 years for each of the 171 killings committed in the village and to an additional 30 years for his role in the murder of a girl who had originally survived. The massacre happened during the brief rule of military strongman Efraín Ríos Montt, who was accused of ordering the killing of more than 1,700 ethnic Mayans during a civil war. He died in April aged 91 while on trial on charges of genocide. Montt was the first military dictator in Latin America to be charged with genocide in his own country. Ronald Reagan was never charged for his role. Some may be tempted to believe propaganda of the Reagan administration that fueling the mass murder of civilians somehow was meant to be about the U.S. fighting Communism. However, recent genocide trials have uncovered facts of Reagan’s “special units” that prove they engaged in genocidal practices, brutally murdering children by hand and terrorizing anyone within earshot of someone speaking about democracy. The soldiers shot, strangled and bludgeoned the villagers to death with sledgehammers, and one admitted to throwing a baby into the village well. In 1994, forensic anthropologists found the remains of 162 bodies in the well, including 67 children less than 12 years old. The above should be serious food for thought when people now talk about news of migrants walking all the way from Guatemala to the U.S seeking aylum from violence. Imagine what they think when finding out they will be greeted with rifles instead. It appears to this historian that the current U.S. regime has replaced the “beans and rifle” decision tree of Reagan’s Guatemalan death squads with…just rifles. A crucial bit of analysis is missing, however. You might, like most rational people watching this video, wonder why someone saying “a public hanging, I’d be on the front row” (death penalty) suddenly can pivot to saying anti-abortion platitudes as their preferred defense against criticism. I mean on the one hand they’re saying lynchings are like their favorite spectator sport, while on the other hand they’re saying not a single life can be ended. Isn’t this an obvious contradiction? Alas, historic context explains the white supremacist perspective here, such as why they see no contradiction in carelessly taking lives while telling others lives can’t be taken under any circumstances. Slavery was an industry of owning humans and birth was the means of production and enrichment for the slave owners. They did not give slaves any rights, let alone choices, when they demanded that children be born as quickly as possible without medical care, to the detriment and death of black women. The historic white supremacist attitude towards maternity rights persists in America even to this day. The ongoing maternal mortality crisis disproportionately affects black women, who the Centers for Disease Control and Prevention notes are three to four times more likely than white women to die from complications related to pregnancy. Why is this happening? The medical field is seeking answers, but one of the most obvious solutions is ensuring black women’s access to quality, unbiased medical care. And then these same owners of humans causing high rates of maternal mortality also claimed to reserve the right to kill humans indiscriminately, murdering whomever they wanted, and brag about their desire for front row seating in any lynchings. See the consistency in the dehumanization? I hope that gives better context and some needed analysis for why the white supremacist candidate Hyde-Smith today is saying “a public hanging, I’d be on the front row”; bringing up lynchings in her campaign to prevent the first black senator to represent the state since the Reconstruction era. The story gets worse, far worse, however. Several people have pointed out to me that very large silicon valley technology companies are funding these white supremacist platforms. U.S. Senator Cindy Hyde-Smith (R-MS) was caught on tape “joking” about her willingness to attend a lynching at a campaign event in November. […] One corporation that apparently was unbothered by Hyde-Smith’s remarks: Google. On Tuesday, Google donated $5000 to Hyde-Smith’s campaign, according to documents filed with the FEC. After other corporate donors had abandoned candidates with a white nationalism (Nazi) platform, and after a candidate made comments in favor of lynchings, Google apparently sent funds to help the white supremacists win. 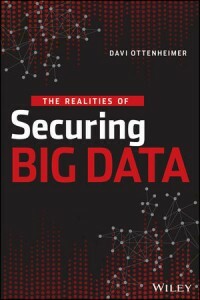 Recently, as I met with many Chief Security Officers (CSO) to discuss cross-cloud security architectures, I heard several times from different leaders “do not mention Google in this room, they are not an option”. It seemed so harsh. And it came without detail, as If I already should know. I had to learn more, to find out what was driving the hard line eliminating the giant brand. I had figred it related to the history of lying about privacy controls and failing to monitor staff abusing access to private data. That was bad, for sure, and Google hasn’t done the best job clearing their name. It also isn’t the sort of thing that writes off a brand entirely, as controls evolve and trust returns through operations monitoring. However, that wasn’t the only issue. People sent me stories about Google choosing to fund campaigns despite widespread (easily searchable) condemnation. I mean Steve King…come on Google, why would you fund him? Even AT&T dumped that unrepentant racist. There seems to be a timing issue for a brand claiming to be the most up-to-date source of knowledge. And it gets worse again. Google now has been caught in further controversy after an attempt to claim ignorance and make a “we do not condone” explanation for their contribution. Google claimed it made the donation on Nov. 2—the same day Hyde-Smith made her comments. “This contribution was made on November 2nd before Senator Hyde-Smith’s remarks became public on November 11th,” Google representatives said. “While we support candidates who promote pro-growth policies for business and technology, we do not condone these remarks and would not have made such a contribution had we known about them.” If Google’s claim were true, that would mean the Hyde-Smith campaign filed a false report. It would also mean the campaign failed to report on time. Federal law requires than any donations made within 20 days of an election be reported within 48 hours. “We do not condone” is not “we condemn”. Historians again are needed here, because context helps explain what’s really going on. Mississippi had the highest rate of lynchings of African Americans, which of course was linked inexorably to economics. Once black were given their freedom, many people felt that the freed blacks were getting away with too much freedom and felt they needed to be controlled. Mississippi had the highest lynchings from 1882-1968 with 581. 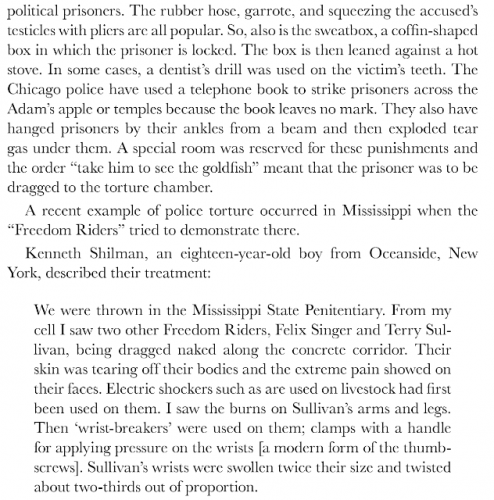 March 1892, a white mob lynched three black men — Thomas Moss, Will Stewart and Calvin McDowell — and left their mangled bodies in a field a mile north of downtown Memphis….their crime was their temerity. They dared to challenge white businessmen accustomed to having a monopoly on economic activity. A Google inability to straightforwardly condemn such a statement about public hangings (see the redemption train video above), while further endorsing white nationalists as being pro-business and technology…should be more in the news. Or how did Lincoln put it? At least I know a wide group of CSOs are monitoring the situation, as a function of deciding how and when to trust a cloud service provider that fails so hard at ethics. Jaz Brisack, the first female student at the University of Mississippi to receive the prestigious Rhodes scholarship, called Sen. Cindy Hyde-Smith (R-Miss.) a “white supremacist” in an interview with The Oxford Eagle on Sunday. Groups including Major League Baseball, Walmart, AT&T, Leidos, Union Pacific and Boston Scientific have all asked for their donations to Hyde-Smith’s campaign to be returned. Google does get a mention elsewhere, asking a day before the election that their contribution be returned. The suit also states that both companies’ scooters contain defective electronics and mechanical parts, as well inadequate safety instructions for riders and that they have “a wanton disregard for the safety of others.” The risks posed by the devices, the suit states, “were known and/or knowable” based on “professional knowledge” known within the transportation community. Scooters weren’t going to magically become safe, by increasing their supply and decreasing barriers to abuse (i.e. powered to a quick and high top speed at no cost to rider). Another way of looking at this is to consider how Vespa was born out of WWII and became wildly successful, was banned, and then returned again. Conversion of Italian warplane engineering to civilian mobility in war-ravaged Europe birthed the famous aeronautical-looking scooters of the 1950s. They were cheap and convenient for rebuilding markets after war, so the concept boomed. And being a success all over again is a good thing, right? I believe that’s called innovation. …environment assessor Italo Porcile is determined not to give in to the pressure. ‘I love the Vespino, I used to have one myself,’ he said. ‘But the ‘Euro 0′ (a model produced before 1999) pollutes terribly and public health is more important’. Piaggio, which started off producing locomotives and then fighter planes, came up with the Vespa after the Second World War, when the country’s roads, severely damaged by bombing, were crying out for an alternative to cars for the masses. Scooters being dumped on sidewalks and running into pedestrians is literally the opposite of innovation. The lawsuit again negligent scooter manufacturers is an unfortunate start, though clearly what scooter developers really needed sooner was a regulatory wake-up to spur them into more innovative designs. His words were meant to capture the tone after an August 1914 outbreak of war, where the German Army invaded Luxembourg and Belgium on the “Western Front”. British commitments to uphold Belgian neutrality (as well as Anglo-French naval agreement of 1912) led it to declare war in response and send forces into France. Some have pointed out England’s response was very unlike their entry into Napoleonic wars where England delayed until 1803 coming to the aid of other nations. However, this provocative thinking is ignorant of history, as Britain faced a very different geo-political situation with the German invasion. Napoleon initially presented the opposite scenario, as his seizure of power within France came with an offering to stabilize and end hostility, given the “1801 Peace of Amiens“. 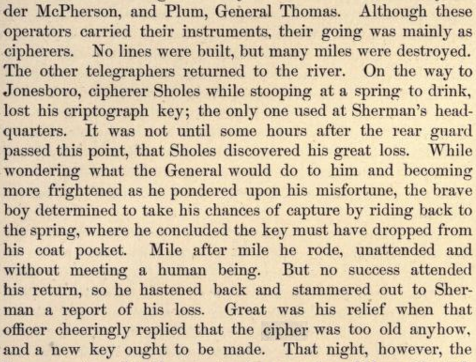 That moment of celebration and hope for peaceful trade definitely was not the situation a year later, when Britain suddenly realized in 1803 they faced complete loss of economic control (Napoleon stated England deserved no voice in global affairs). Germany in 1914, like France in 1803, was threatening Britain’s empire. Delay didn’t seem to be a real option in 1914, given early attempts at German defeat (no matter how unlikely) could avoid another protracted decade-long Napoleonic war situation (1803–1815). The 1914 German attack threatened stability and safety across Europe and beyond as it violently pushed all the way into France reaching the eastern Paris outskirts. From September 6th to the 10th, six French armies and the British Expeditionary Force (BEF) counter-attacked along the Marne River and defeated the German Army, forcing retreat northwest. On 9 September Bülow learned that the British Expeditionary Force (BEF) was advancing into the gap between his 2nd Army and Kluck. He ordered a retreat, obliging Kluck to do the same. The counterattack of the French 5th and 6th Armies and the BEF developed into the First Battle of the Marne, a general counter-attack by the French Army. By 11 September the Germans were in full retreat. This remarkable change in fortunes was caused partially by the exhaustion of many of the German forces: some had marched more than 240km (150 miles), fighting frequently. The German advance was also hampered by demolished bridges and railways, constricting their supply lines, and they had underestimated the resilience of the French. France suffered approximately 250,000 casualties in this battle as German forces desperately tried to take Paris. Germany refused to acknowledge their losses. And BEF casualties were recorded as 12,733. Perhaps most significantly, BEF losses signaled the significance of an allied front against German aggression. Some still debate had the BEF and French armies gone further, whether they could have ended German campaigns early and entirely. A battle in September 1914 thus is considered one of the most important in WWI history, as German retreat at Paris destroyed the “Schlieffen Plan”; quick victory in the West was meant to allow focus on attacking Russia. Instead, Germany was forced to dig in for a protracted war on two fronts. Despite being able to regroup after this battle, ultimately German defeat four years later meant nearly 3 million of its own people killed. “They Shall Not Grow Old”, named after a September 1914 poem, commemorates in new ways how the British decided to act early and decisively in response to German aggression, saving France and Russia from occupation. An original written copy of “For the Fallen” has been digitized by the British Library. 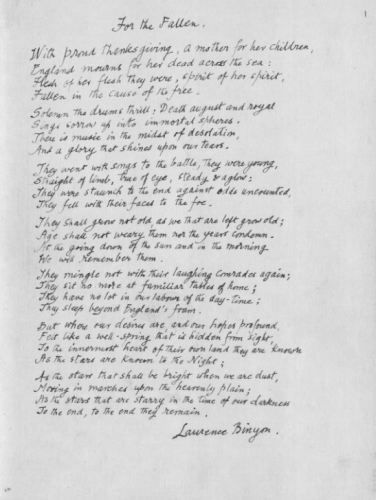 ‘FOR THE FALLEN’: autograph copy of poem by Robert Laurence Binyon, C.H., made for presentation to the Museum; 1938. First published in The Times, 21 Sept. 1914, and in book form in The Winnowing-Fan, 1914, pp. 28, 29. Now, as you just read it, did you ponder whether adding color would help? Is that ink black or blue? What is the true shade of the paper? Copenhagen is estimating a $1-2 million gain every day — that’s right, EVERY DAY — when people in the city ride bicycles instead of drive cars. 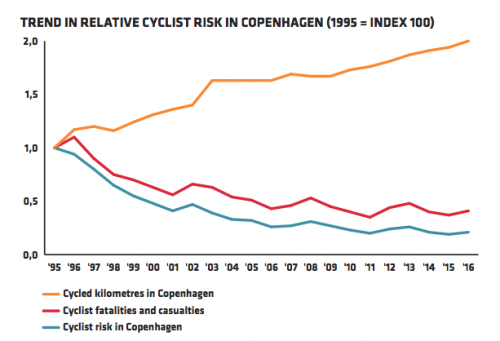 Since the biggest friction to cycling is the fact that cars kill those around them either immediately (crash) or slow and painfully (disease), a great deal of money and time is being spent by the Danes to isolate cars and reduce societal harms. I wrote the other day about a cities around the world that are banning cars altogether in their city center, some on an accelerated 5-year timeline such as Oslo and Madrid. Given all the data above, it should come as no surprise Copenhagen is considering the same road forward and banning cars entirely from some neighborhoods. With the most-successful city out of the running, the list then goes on to recommend being in the Tenderloin of SF. The author clearly hasn’t tried riding down the infamous Golden Gate corridor of Tenderloin cars parked or driving in the bike lanes. 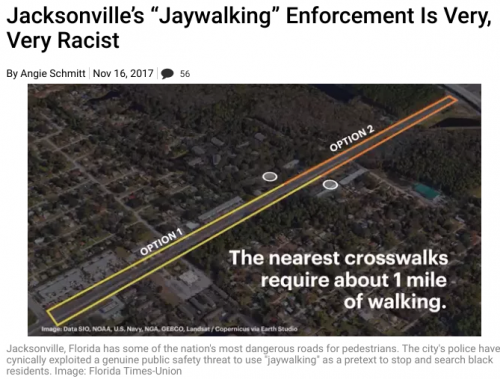 Why anyone would eliminate the best option in America and then recommend living in a filthy run-down neighborhood with awful bike and pedestrian access options…is beyond this blog post. But it definitely shows American analysts often don’t understand this transit topic. First, they don’t factor for overall health improvements as a function of car-less urban spaces. They just draw a circle around transit stations and measure nothing else. That isn’t how this works. Second, based on the radius of the circle they think like car drivers and assume you are better off living directly above a subway as if it’s a straight substitute for having a car in your garage. Remember at the start of this post how the distance traveled by foot/bike leads to multiple facets of financial and health improvement? Forget about the model where you roll out of bed and stumble into an elevator that drops you into a car so you can avoid using a muscle. Wrong quality of life model. Yeah, go live in the desirable places surrounding the transit line, not inside the train station. Moreover, let’s be honest here, the author also regurgitates an old American white supremacist trope, probably without even knowing. All of San Francisco is known for drugs, and crime is widespread. You literally can’t go to a neighborhood in SF and find it free of drugs. This tracks to the rather sad fact that Nixon’s racist “war on drugs” still lives on, giving people the impression urban areas are dangerous because “drugs and crime” (Nixon’s propagandist way of saying blacks and pacifists). In fact, the only reason Highway 101 abruptly ends at Octavia and does not cut through the Haight (a formerly black neighborhood) and Golden Gate Park as planned is because civil-rights protests blocked “disruption” for white-flight-suburb road construction. There is no highway to this day running through urban SF because quality of life protests against it meant the successful rejection of white supremacist propaganda, which meant streets and houses instead of overpasses and parking lots. Tenderloin is not more dangerous than the Mission area, which also lies “adjacent to the rapid transit line”, and it certainly is not more dangerous than the Marina if you are measuring getting raped by white football player who just moved to SF to party and “get some” before getting appointed to Vice President or the Supreme Court. Nixon was elected because he said things like blacks can’t handle drugs, and he enacted policies to incarcerate blacks and not whites for the same behaviors. And that’s just a modern version of America First, which in the early 1900s under President Wilson argued non-whites (Irish, German, Blacks…) couldn’t handle liquor. Prohibition was passed to destroy black lives, while whites could continue producing and drinking because notes from wealthy/connected doctors cited “medicinal” reasons. Anyway, if you want to cite SF, look at the SOMA neighborhood sitting at the head of the CalTrain station, adjacent to the new high-speed rail station, and also on the new north-south local transit line, which will feed into BART, not to mention on the water with easy access to the ferry. SOMA has far superior pedestrian, cycle and transit options to the Tenderloin or any other neighborhood in the city. This tracks historically to SOMA having amazing trolley grids before the car enthusiasts ripped it all up to drive up air/noise pollution and cause traffic jams as their preferred lifestyle. Since the scheme began, road deaths have almost halved: 270 people died in road accidents in Sweden in 2016. Twenty years earlier the figure was 541. America lags so far behind on this topic, its numbers are in a completely different ballpark. While Sweden is annoyed that it only has seen a 50% reduction in death from cars, some states in the US are actually tracking increases. Texas, for example, apparently is aborting human life at an alarming rate by repeatedly failing to address cars as a threat to health. NSC estimates traffic fatalities in New York fell 3 percent last year and have dropped 15 percent over the last two years. Safety advocates say the decline may be due to New York City’s push to eliminate traffic deaths by lowering speed limits, adding bike lanes and more pedestrian shelters. When NYC releases the financial and healthcare benefits that derive from fewer cars, maybe it will help steer the discussion forward in Texas. Seems unlikely, though, as Texans do not seem to be pro-life as much as they think their success is measured by ability to collect and carelessly operate things that kill others. American cities in places like Texas paint a stark contrast to the quality of life stories around the world, and especially Scandinavia, that highlight enabling people with the freedom to live, without being unjustly harmed. The automobile industry is going through a transformation that will be wise to learn from the leaders, gaining trust in urban areas committed to freedom and justice through respect for diverse ideas and modes of movement. 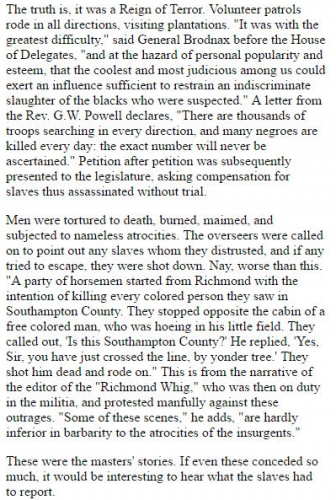 American transit managers of the southern states who watch their neighbors and friends be killed by drivers without feeling any guilt should in the near future be about as common as politicians today who would look the other way when they see slave drivers. The agreement led to annexation of Czechoslovakian border territory by an expansionist Nazi regime, and the designation of this area as “Sudetenland”. It also setback plans to overthrow the fascist dictator of Nazi Germany. Opponents of the Nazi regime leader, such as the head of the German Army, perceived the Munich agreement as foreign states having weak appetite for more permanently ending the Nazi terror and social pressure. Auto campaigners lobbied police to publicly shame transgressors by whistling or shouting at them — and even carrying women back to the sidewalk — instead of quietly reprimanding or fining them. They staged safety campaigns in which actors dressed in 19th-century garb, or as clowns, were hired to cross the street illegally, signifying that the practice was outdated and foolish. In a 1924 New York safety campaign, a clown was marched in front of a slow-moving Model T and rammed repeatedly. 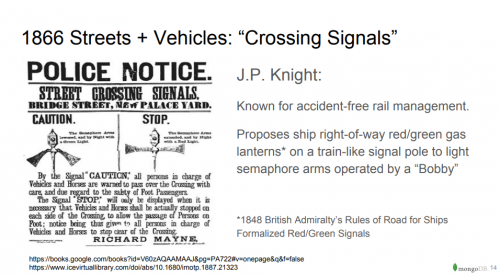 British railroad managers took ship right-of-way red/green lanterns and recommended using them to stop vehicles so pedestrians could walk safely. American car manufacturers then took that street light concept and flipped it around completely, telling pedestrians to stay off roads, inventing a fantasy crime to shame and physically harm certain races of people for not driving. In cases like jaywalking, which often hinge on police discretion, blacks accounted for 95 percent of all arrests. A bill introduced by an oil patch lawmaker would provide an exemption for the driver of a motor vehicle if they unintentionally injured or killed a pedestrian obstructing traffic on a public road or highway. Several months later, Kempenich’s campaign led to a federal civil rights investigation of a white nationalist for murder instead of the zero liability for killing people with cars, which he had promoted to them. One person was killed and 19 were hurt when a speeding car slammed into a throng of counterprotesters in Charlottesville, where a “Unite the Right” rally of white nationalist and other right-wing groups had been scheduled to take place, the city tweeted on its verified account. A 32-year-old woman was killed while walking across the street, Charlottesville Police Chief Al Thomas said. Police were still in the process of notifying her family. Federal authorities said a civil rights investigation into the deadly crash was opened hours after it happened. The results they have reported are amazing. Can’t wait to hear what Buress has to say about it.